One of the earliest obtainable plains of Sydney, Australia. 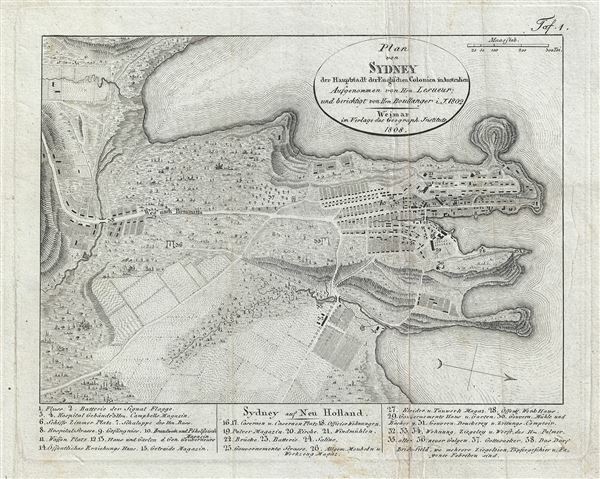 One of the earliest obtainable maps of the city of Sydney, Australia, this is an 1808 German edition of an 1802 manuscript Map by Charles-Alexandre Lesueur's. The map covers from Darling Harbour to Dawes Batter and from Woolloomooloo to Brickfields. At the bottom of the plan there is a numbered index identifying 38 important buildings. In addition the map note roads, buildings, windmills, gardens, orchards, gallows, brickfields, and the cemetery. The manuscript on which this map is based survives in the collections of the Museum d'Histoire Naturelle, in La Havre, France. Lesueur accompanied the Napoleon sponsored expedition of Nicolas Baudin, which said form Le Havre on October 19, 1800. Initially he signed on an assistant gunner, but his skill at drawing, mathematics, and scientific observation were promptly recognized and he was reassigned as the ship's 'artist' and 'assistant naturalist.' Although Lesueur is most commonly credited with the authorship of this map, he more likely simply assisted in the illustration of a map prepared by Charles Pierre Boullanger, a midshipman on the same vessel. In this examples title area Boullanger is credited with 'correcting' the map, but we suspect this ghosts over his actual deeper involvement. The French and English were at this time in the midst of the Napoleonic Wars and we can only imagine that the British musts have felt considerable trepidation as their militarily sensitive harbor was mapped by a government sponsored French expedition. The map was first engraved by Jean Baptiste Antoine Cloquet and printed in the 1802 French edition of Francois Peron's Voyage de decouvertes aux terres Australes. The work proved popular and subsequent editions followed in French, English, and German. The present example is the earliest German edition we have been able to identify and as such, quite uncommon. It was published by Geographischen Isntitutes of Weimer and is one that organizations earliest and most significant publications. Charles Alexandre Lesueur (January 1, 1778 - December 12, 1846) was a French naturalist, artist, and explorer active in the early 19th century. In 1801 Lesueur signed on as a gunner in the Napoleon sponsored expedition of Nicolas Baudin. Early in the voyage Lesueur was recognized as a fine artist and keen observer and, after the death of the expedition's zoologist Rene Mauge, he was promoted to 'assistant naturalist' under Francois Peron. Most of the important sketches surviving from the Baudin expedition are the work of Lesueur. Cartographically he is known for two important plans of Sydney, Australia, among the first made. Following the expedition he relocated to New Harmony, Indiana, United States where he lived from 1815 to 1833. He was in New Harmony when Prince Maximilian, Prince of Wied-Neuweid, Germany, and artist Karl Bodmer came to spend five months there in 1832–1833. Prince Maximilian said of Lesueur "He had explored the country in many directions, was acquainted with everything remarkable, collected and prepared all interesting objects and had already sent considerable collections to France" (Elliott & Johansen, p. 6). In 1837 Lesueur returned to his home town of La Harve, France, where he was appointed curator of the Musee d'Histoire Naturelle du Havre. There he died in 1846. Peron, Francois, Entdeckungsreise nach Australien, unter Nommen auf Befehl Sr. Maji des Kaisers von Frankreich und Konigs von Italien mit den Korvetten der Geograph und der Naturalist, und der Goelette Kasuarina in den Jahren 1800 bis 1804, vol. 1, (Weimar: Geograph Instituts), 1808. Good. Minor wear and verso reinforcement along original fold lines. Light soiling. Perry, T and Prescott, J. F., A Guide to Maps of Australia in Books Published 1780 - 1830, 1808.3. Bonnemains, J., Forsyth, E., Smith, B., Baudin in Australian Waters, 16074.3. McCormick, Tim, First Views of Australia, 1788- 1825: A history of early Sydney, no. 62.